[272 Pages Report] The global ophthalmic surgical instruments market is expected to reach USD 11.18 Billion by 2022 from USD 7.87 Billion in 2016, at a CAGR of 6.0%. Growth in the global market is mainly driven by factors such as the increasing number of ophthalmic surgeries owing to the growth in geriatric population & related eye diseases, technological advancement in ophthalmic surgical devices, and government initiatives to increase the awareness about visual blindness across the globe. Top-down and bottom-up approaches were used to validate the size of the global ophthalmic surgical instruments market and estimate the size of various other dependent submarkets. Major players were identified through secondary research, and their market revenues were determined through primary and secondary research. Secondary research included the study of International Council of Ophthalmology (ICO), American Academy of Ophthalmology (AAO), All India Ophthalmological Society (AIOS), European Board of Ophthalmology (EBO), Asia Pacific Academy of Ophthalmology, and the annual & financial reports of top market players, whereas primary research included extensive interviews with the key opinion leaders such as CEOs, directors, and marketing executives. The percentage splits, shares, and breakdowns of the product markets were determined using secondary sources and verified through primary sources. All possible parameters that affect the market covered in this research study have been accounted for, viewed in extensive detail, verified through primary research, and analyzed to get the final quantitative and qualitative data. This data is consolidated and added with detailed inputs and analysis from MarketsandMarkets and presented in this report. The prominent players in the global ophthalmic surgical instruments market are Alcon (Switzerland), Carl Zeiss Meditec (Germany), Johnson & Johnson Vision Care (US), Hoya Corporation (Japan), Bausch + Lomb (US), NIDEK (Japan), Topcon Corporation (Japan), Ellex Medical Lasers (Australia), IRIDEX Corporation (US), Lumenis (Israel), STAAR Surgical Company (US), and Ziemer Ophthalmic Systems (Switzerland). The global ophthalmic surgical instruments market is estimated to reach USD 11.18 Billion by 2022 from USD 8.36 Billion in 2017, at a CAGR of 6.0%. Growing geriatric population and associated ophthalmic disorders, increasing number of ophthalmic surgeries owing to the rising prevalence of eye diseases, technological advancements, and rising government initiatives to increase the awareness of visual impairment are the major factors driving the growth of the market. However, the limited reimbursement for ophthalmic surgical procedures and high cost of these instruments may hinder the growth of this market. Furthermore, the lack of awareness and accessibility to eye care in low-income economies is a major challenge for the growth of the global market. In this report, the market is segmented by product, end user, and region. By product, the ophthalmic surgical instruments market is majorly segmented into cataract surgery devices, refractive surgery devices, glaucoma surgery devices, vitreoretinal surgery devices, ophthalmic microscopes, and accessories. The cataract surgery devices segment accounted for the largest share of the market in 2016. The growth in this market is mainly attributed to the rising number of cataract surgeries performed across the globe owing to growing geriatric population and associated eye diseases such as age related macular degeneration (AMDs), diabetic retinopathy, and other eye disorders. The glaucoma surgery devices segment will be the fastest-growing segment and based on its types, the glaucoma surgery devices market is segmented into glaucoma drainage devices, glaucoma laser systems, microinvasive glaucoma surgery devices, and glaucoma surgery instruments & kits. The glaucoma drainage devices segment accounted for the largest share of the market in 2016. The large share of this segment can primarily be attributed to the increasing use of glaucoma drainage implants for controlling surgical intraocular pressure (IOP) in patients with uncontrolled glaucoma. On the basis of end user, the ophthalmic surgical instruments market is segmented into hospitals, specialty clinics & ambulatory surgery centers (ASCs), and other end users. In 2016, the hospitals segment accounted for the largest share of the global market. Factors such as increasing prevalence of eye disorders across the globe coupled with large patient pool treated at hospitals, high purchasing power of hospitals, and increasing number of hospitals in emerging countries are the key market drivers for this segment. Geographically, North America represented the largest regional market in 2016, followed by Europe. 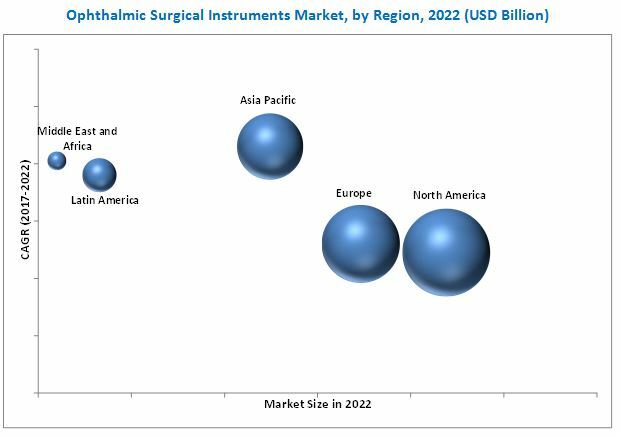 Although, North America will continue to dominate the global ophthalmic surgical instruments market during the forecast period, the Asia Pacific (APAC) region is expected to be the fastest-growing market in the coming years. Growth in this region is driven by the growing geriatric population, rising prevalence of ocular diseases, increasing awareness about advanced surgical instruments, and rising healthcare expenditure in this region. Moreover, the growing medical tourism, increasing per capita income, and improving healthcare infrastructure is also supporting the growth of this market in Asia Pacific. However, the high cost of ophthalmic surgical instruments and uncertainty in the reimbursement structure in the ophthalmology industry will limit the adoption of technologically advanced ophthalmic surgical devices among small- and mid-sized hospitals, thereby limiting the growth of the ophthalmic surgical instruments market in the coming years. Major players in this market are continuously focusing on securing high market shares through product launches, expansions, agreements, partnerships, and acquisitions. The prominent players in the market are Alcon (Switzerland), Carl Zeiss Meditec (Germany), Johnson & Johnson Vision Care (US), Hoya Corporation (Japan), Bausch + Lomb (US), NIDEK (Japan), Topcon Corporation (Japan), Ellex Medical Lasers (Australia), IRIDEX Corporation (US), Lumenis (Israel), STAAR Surgical Company (US), and Ziemer Ophthalmic Systems (Switzerland).